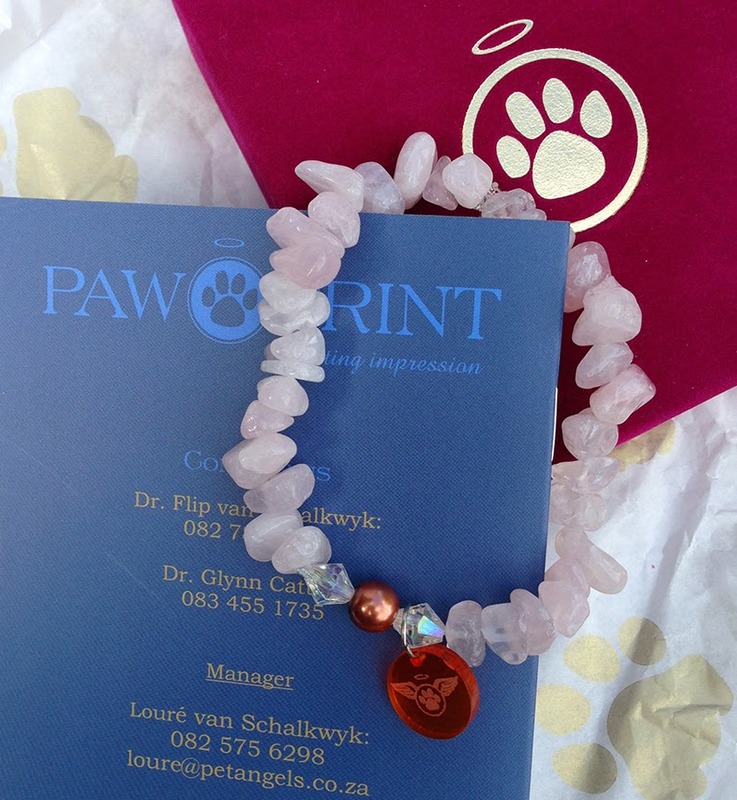 We’re so blessed to have an Earth Angel, in the form of Louré van Schalkwyk, the animal undertaker from Paw Print Pet Cremation Services, who assisted us with Inca’s cremation. He placed a beautiful message on their website in memory of Inca. I was also invited to write my own farewell message for their Remembrance Wall and it gave me a great sense of peace in doing so. Louré told me the time of the cremation so I was able to go into my Reiki room and light some candles and beam Reiki to Inca in spirit, while her mortal remains were being transformed and transmuted into Earthly dust. I connected with her in the Spirit World and I clearly saw her beautiful face surrounded by a golden halo of God’s Heavenly Light. I saw another picture of her bathed in golden Light, with huge sunflowers behind her. To the right of her, I saw the most magnificent sight – an entire field of sun flowers, filled with the same brilliant golden Light. I’ve always loved sun flowers, but now they have an extra special meaning for me. Each time I see them now, I will think of my beautiful Kitzi, and know that she’s sending me love from the Summerlands, where she’s chasing butterflies, happy and carefree. 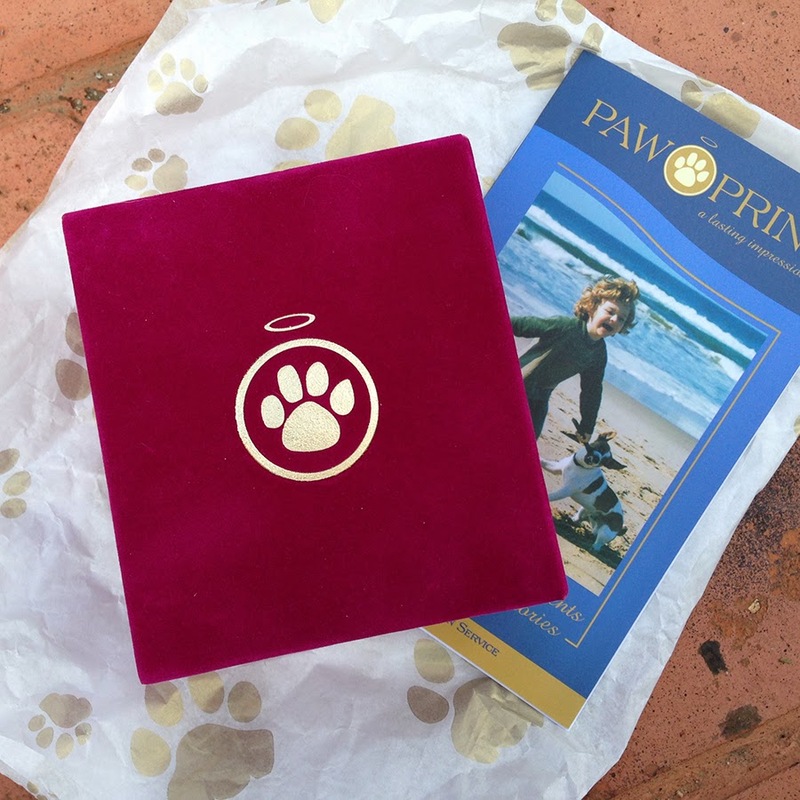 Several days later, I received Inca’s ashes in a stunning cerise velvet box, embossed with the gold Paw Print logo. 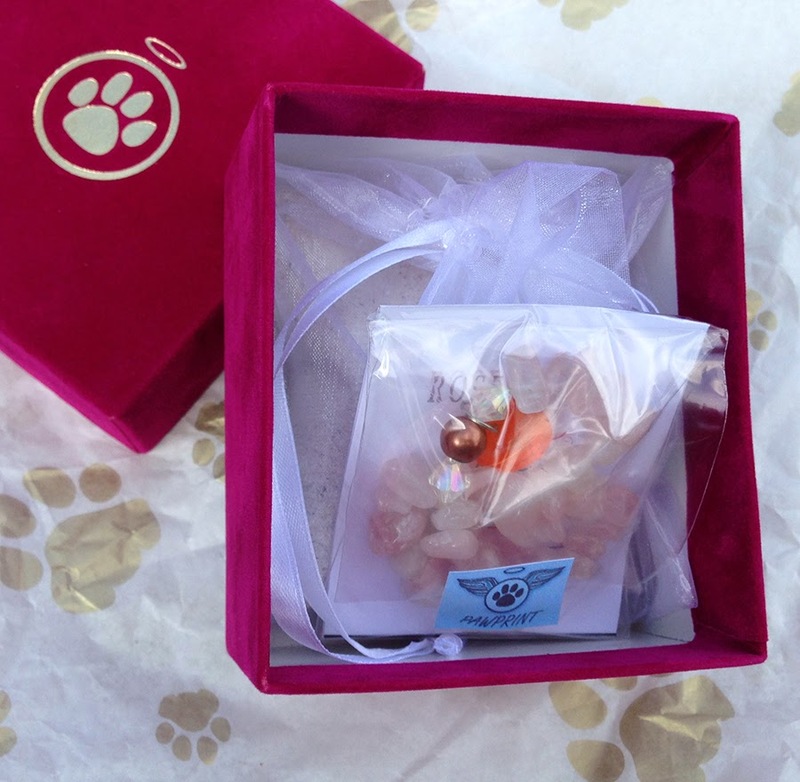 The box was enclosed in delicate white tissue paper decorated with gold paw prints. 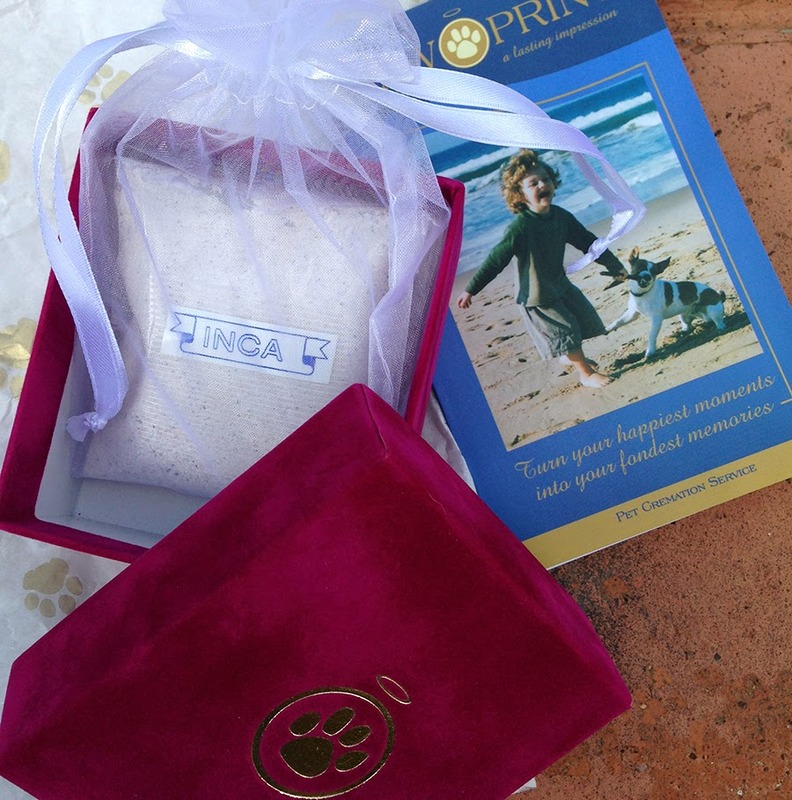 Also included in the presentation bag was a little Ceremony Book, containing information celebrating Inca’s life and a blank page for her photo, a colourful Teardrop Healing Mandala Meditation and words of wisdom on grief. I wear the bracelet every day and I feel the beautiful uplifting energy of the stones, reminding me of the deep bond of love we share with our animal companions which continues to exist beyond time and space. “Farewell dearest Inca, may your soul fly on wings of love to the Light. We love and miss you Kitzi and we thank you for being a part of our lives all these years. Thank you for your healing paws and all the healing you gave us. You taught me so much. On the night of Inca’s passing, I felt I had to contact her in the Spirit World, just to make sure she was ok. I drew the Reiki symbols and soon my hands heated up, as I connected with her. She said she was ok, and I got a sense of her being completely at peace and safe in the Light. But I didn’t see her as her feline self, instead I got an impression of a priestess, and I was even more amazed to discover that she and I were both priestesses in a past life in Egypt. I learnt that we were from the same soul group, so she really was my soul-mate. I knew that she’d lived a past life with our family in this present life time, as Mazzy-Starr – my daughter's cat, before coming back to us in the form of Inca. 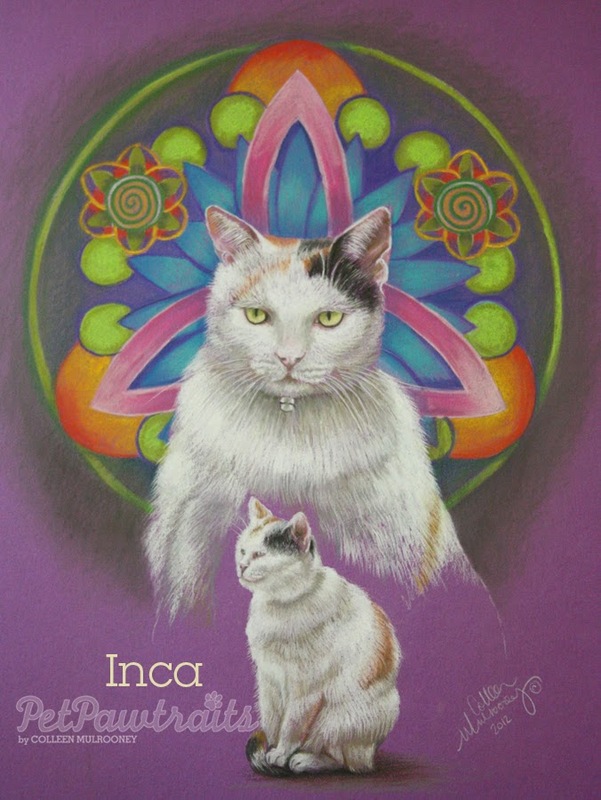 I knew that in one of my previous lives I was a witch and a healer, and I now saw that Inca was my companion in her feline form in that life time. I’d asked my parents and our dogs in spirit, Mac-Tavish, Nikki and Maxi to meet Inca at the Rainbow Bridge, and they did. I saw them all clearly greeting her, and I was surprised to find my brother, who is also in sprit, standing in the front of all of them. When Inca left, I felt that she’d taken a chunk of my soul with her, and I miss her so much, as she was my constant companion, especially at night, when she slept on or bed. But I know that the souls of our animal companions – and ours – are inexorably linked for all eternity. I know that they will continue to reincarnate with us, to share our lives and assist us on our spiritual path, sharing their soulful knowledge and wisdom with us, through many, many lives. 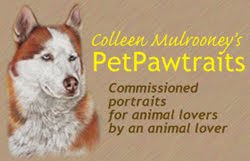 to share or receive from your animal friend; please get in touch with me. to deal with the loss of their animal friend. My feline companion Inca, had been suffering bouts of ill health for a while and with a sinking heart I knew that the heart-wrenching day no animal lover ever wants to think of – was soon approaching. As the days rolled by, I became increasingly grateful that I had been attuned to Reiki. Not only did it help Inca to cope with her illness, but it was also a time of special togetherness, of reflection and introspection. She would lie on my lap while I channelled the energy – purring happily. Occasionally I would move my hands to the areas of her body she specifically wanted treated. Sometimes she would lie fully stretched out on the bed, for over an hour, just absorbing the energy. 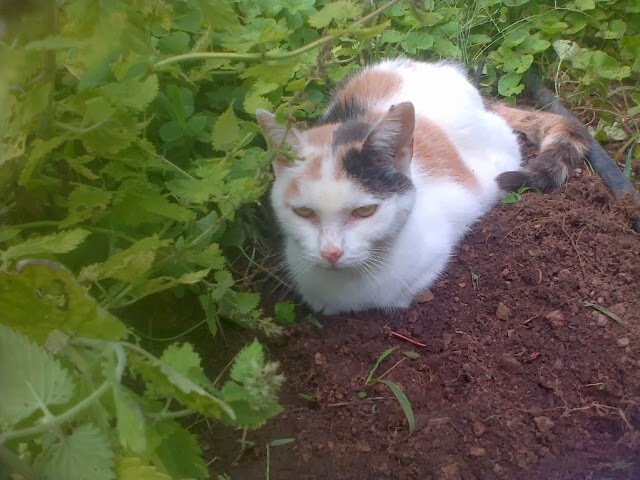 The day before her passing I put her in the herb garden, her favourite spot, where she loved to sit amongst the catnip plants. When I went to check on her later, I was surprised to find that she was not there. The gardener said he saw walking at the bottom of the garden, and I got the feeling that she was saying goodbye to all her favourite haunts. She returned later and I began to feel hopeful as she seemed much better. But my joy was short lived as during the early hours of the morning she called loudly to us from her bed. She seemed to be having seizures. It was terrible to watch, her eyes were huge, and she was breathing heavily; her body was stiff and shaking. 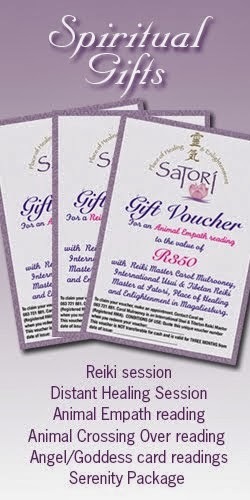 I wrapped her in a towel, gave her some Rescue Remedy and I sat with her in the reclining armchair giving her Reiki. She eventually calmed down and dozed off to sleep. I kept channelling Reiki and asked my Divine Helpers to help her, with whatever she needed at this time for her highest good. I asked Archangel Raphael for his help, and to fill her aura with his green healing light. As the eastern sky ushered in the dawn, I knew this would be Inca’s last hours with me, in her physical form. Tearfully I thanked her for everything, telling her that I loved her and that I released her in Love and Light. I told her we would have to take her to the vet to help her to cross over, and was she ok with that, she said she was. I asked for Reiki to keep flowing to her every minute from then and especially during her transition. The vet tried her best to comfort us, but it was very difficult, as our tears continued to fall as we said goodbye to her again. I told her that as soon as the vet starts the procedure, she must go quickly to the Light. And she did. She just slipped peacefully away into Spirit.